Good day to all you HPR Listers. Sorry that its been a while since I recorded a show, but as they say life has got in the way over the last few months, and I've spent quite a bit of it away from the home front. As it happens on one of those trips away my laptop running Mint Mate 18.3 LTS, based on Ubuntu 16.04LTS decided that it wouldn't boot as it didn't recognise my account, and as I had not created a Root account I could not sign in and fix the issue, which was a corrupted configuration file in the users folder. As luck would have it I had just downloaded the latest Ubuntu Mate 18.04 .iso to try it as a live disc, so I had a boot disc that I could use to boot the laptop and access the data to rescue all my important information which was mainly all my emails and my browser settings and bookmarks, as this is one of my travelling laptops not much of importance is permanently stored on it, so it didn't take long and I was ready to reinstall the OS to the PC. Just in case I had missed some important data on the current SSD, as I had a spare SSD with me in the bag, yes I'm geeky enough to carry a spare SSD or 2 in the bag. So I dug it out and installed it into the PC, which by the way is a Dell Latitude E6540 with an i5 dual core mobile chip with hyper-threading. It's currently running 4Gig DDR3 RAM but can run up to 16Gig in the 2 slots it has. So I booted the laptop with the USB boot disc I had created and as with all recent Ubuntu releases you get a screen asking if you want to try or install the OS, as I needed a working PC I went straight to the install option. For those not familiar with Linux or Ubuntu, the installer is a joy to use and very friendly to new users. As this was a first install to this SSD the only option I had was a full install which I chose, then was asked if I wanted to do the default install which partitions the drive and installs the bootloader automatically without any further need for intervention or did I want to do a custom partition arrangement. As the default is adequate for my needs I chose this and clicked continue. During this process you also get the option of a minimal or full installation, the minimal installation gets you a running PC with the basic utilities and leaves you to chose what to install later, but as I use the software that would be omitted I chose the full install. You get asked a final time if you are sure you want to install, with a warning that all current data on the disc will be wiped, as I was happy I clicked proceed. At this point the install starts and you are taken through setting up your PC configuration for language, keyboard, and user account. By the time I had completed this, the install was half completed and the whole process took less than 15 minutes. After the install is complete you get the message to reboot the PC and eject the boot media to reboot into the new install, on first boot you will either be presented with the login screen or go straight to the desktop depending on the choices you made during the install. Once you are at the desktop for the first time you are presented with a wallpaper of the Ubuntu Mate logo and 2 panels one at the top and one at the bottom of the screen. The top one has for those more traditional Linux and Windows users all the information you would expect on the lower panel, such as the menu, notification area etc. As I'm more traditional in my use of a PC I quickly set up the lower panel with the Advanced Mate Menu and other notification apps such as network, clock and calendar and then deleted the other panel, but obviously this is a personal preference - go with what you find comfortable. The next step after connecting to the local WiFi was to install any updates, which despite this release only being a few days old there were a few, but this didn't take long and in less than an hour, which included backing up and swapping out the SSD I had a fully working laptop running Ubuntu 18.04 Mate. So there are a few bits of software not included by default in Ubuntu which I use regularly, one of which is synaptic so I opened the terminal and a sudo apt install synaptic later I had the package manager on the PC. You may ask why, but the software Boutique doesn't seem to have all the software available in the repositories and I don't always know the appropriate name of software I'm looking for to use the terminal all the time, so synaptic is a tool I use a lot. The next software that gets installed is Audacity as I use this for editing audio and sometimes extracting the audio stream from videos of the internet, most importantly for HPR listeners it is what I use to record and edit my HPR shows. 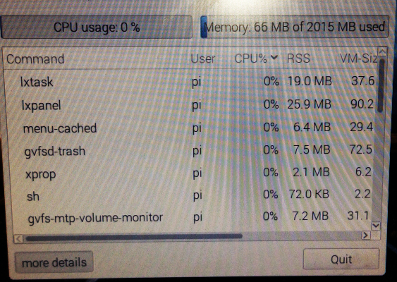 So back to Ubuntu 18.04 Mate, I've been running it for a month on the laptop and about 3 weeks on my main box and as you would expect from a LTS (long term support until 2023) it's very solid and stable, I had a glitch transferring my e mails into Thunderbird on my main box, it had worked flawlessly on the laptop, so I ended up having to reinstall from scratch and on the second install it went perfectly, I think it was down to the way I set up Thunderbird which screwed things up, not the OS, but it's all fine now and I didn't lose anything in the process. For me coming from Mint there are a couple of utilities the Mint developers have implemented that are not available in Ubuntu, but nothing I can't work around. Saying that, if there are any Ubuntu developers out there, the Mint USB drive formatter and USB boot disc creation utilities are nice and simple to use but not available in the Ubuntu repositories. Obviously I've only had limited time to get to use the new OS but so far it doesn't seem too bad coming back to the mother ship so to speak from several years of using Mint Mate, virtually since its inception, but as I record this there has been nothing that has made me feel I need to rush and reinstall Mint, so I'll continue with Ubuntu Mate 18.04 at least until the new Mint19 based on this Ubuntu release comes out. Hi To all in HPR land, this is Tony Hughes in the UK back with you. I noticed that the queue has a couple of gaps in the next week or so here goes again. Apart from my last show I've recently done shows on current Linux distro's that are suitable for older hardware but with a modern look and feel and fully featured with the latest software available. I completed the install and on first boot after install the boot time had risen from about 40s to over 2 minutes, I suspected a problem with the install so did it again with the same result. I couldn't find any issues reported on the net so resorted to installing Linux Lite which is based on Ubuntu 16.04 as is Mint 18. The problem persisted after this install despite getting near 40s boots on the Lenovo X61s with an SSD and the same Distro. MX Linux is a joint venture from the antiX and former MEPIS communities and is based on the latest Debian Stable "Jessie" with the XFCE desk top environment. I duly downloaded it and installed it in a Virtual PC using virtual box to see what it looked and felt like. The install is fairly user friendly although if you've never had experience of Linux and installed other Distributions a new user may be a bit unsure when asked about the MBR and where to put it, other than that a fairly straightforward install. On install there is a fairly good selection of the software you would need including a full install of LibreOffice, FireFox, Thunderbird, GIMP and synaptic package manager for adding further software from the repositories. MX have also included the ability to simply install codecs and additional drivers and a software installation system for popular Apps from the MX Welcome that comes up at boot or if disabled can be started form the menu. Also I installed it on a virtual 8Gig HDD and GParted reports use of 4.64Gig after install and updates, by default it only installs a 1G swap despite 2Gig allocated Ram in the VM. I liked the look of MX and decided to give it a go on the X230i, install went smoothly and lo and behold boot was back to around 40s on first boot after install. So I've updated the install, installed my packages I use that are not there by default such as Audacity, Scratch and a couple of other things I use. I've also put it on the X61s I use and again working faultlessly, so I'm happy again. Since I installed MX I found out from a member of my Makerspace/LUG that he had experienced the same problem with Ubuntu 16.04 based distro's and crippled SSD Boot times. I like MX so much when it come to time to reinstall my Desk Top PC, which is about the only PC I use that is not constantly changing OS, I think I will be putting MX on it. This is a big deal for me as I've been a loyal Mint user for over 5 years but MX is working so well on the Laptops at the moment it would be good to have the same OS on the Desktop PC as well. Will MX stop my Distro Hopping, NO, I like trying out new things that's why I have several Laptops kicking around so I have spare hardware to try out new Linux stuff, but it is good to have something stable around when you need it, hence sticking with Mint for so long on the Desktop. I built a new desktop computer with AMD components. In this episode, Claudio talks about his current desktop PC and covers the what, why, and how of his new CPU purchase.